My second recipe for the month of June in the Mellow Bakers Challenge is Hamelman’s pizza dough. I was anxious to try this one, to compare it with my favorite recipe, that you can find here. Hamelman’s dough uses a biga – a pre-ferment of flour, water, and yeast – that is incorporated in the final dough, together with a small amount of additional yeast. Apart from that, the recipes are quite similar. Last week we had a small pizza party at home, and Hamelman’s method was put to the test. It passed with flying colors, or… should I say… ballooning colors! In the Summer, we avoid turning the oven on, so we use our grill as an improvised oven, placing unglazed tiles over its grids, and cooking the pizza on them. This is not a grilled pizza, simply a regular pizza baked inside the grill. Once you get the temperature right, it works like a charm, each pizza will be ready in about 7 minutes. My husband was the one who had the idea for this “oven-grill-method”, yet another evidence that I won the jackpot when I married him. So, what’s the verdict? This dough deserves to share the first prize with my default recipe – excellent texture and flavor. The only thing that prevents me from placing it ahead of Fine Cooking, is the 2 hour rise with a folding cycle after 1 hour. That makes it slightly more complicated to have pizza on a weeknight. But, it is a minor detail, and I will definitely be making this recipe again and again during the weekend. That evening, we made 8 pizzas, this one was particularly tasty: sauteed cremini mushrooms, roasted yellow bell peppers, and smoked mozzarella. Pizza parties are a lot of fun! Many Mellow Bakers have already enjoyed their pizzas, if you want to see their report, jump here. One year ago: From Backyard to Kitchen…. Looks amazing! Great idea for the grill/oven method too. 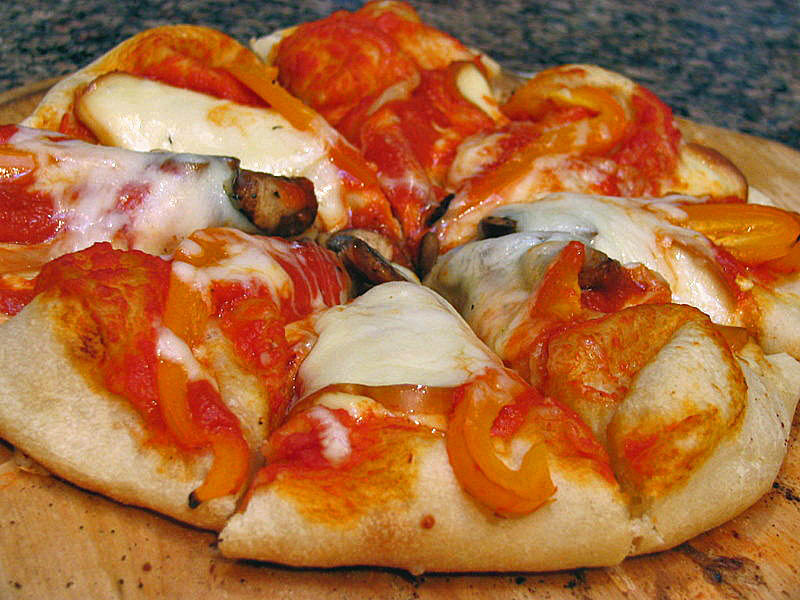 The sauteed crimini, roasted yellow peppers, and smoked mozzarella toppings sound perfect! Wow! Your pizza looks so good! Great idea to use the tiles on the grill instead of grilling it directly on the grates. I’ll have to try that. Love the grill-baking idea! So creative! We love pizza parties, too, but it’s practically painful to turn the oven to 500F for a couple of hours when it’s so hot outside! The pizza in the picture looks divine! Nice idea about the grill, you should keep him. 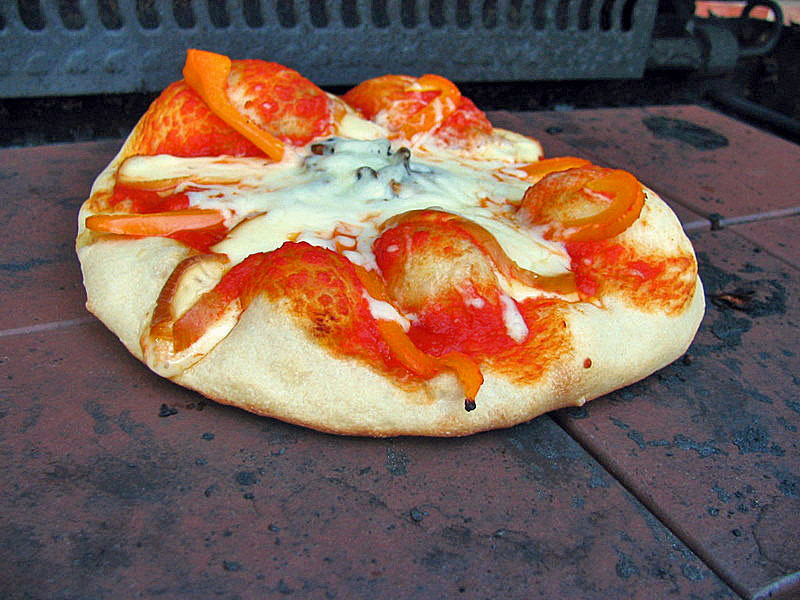 Nice idea to turn your grill into a pizza oven! So looking forward to making this pizza this weekend – it looks divine! For those of you trying this method: do not use more than 6 tiles, or the grill will be too hot – it’s important to leave some space on the sides for circulation of air. I leave the paper for about 3 minutes, then remove it – but it won’t burn even if you leave it there for the full cooking time, it will only get very dark and a bit brittle. Start with the grill on high, but if the bottom is darkening too fast, reduce the heat to medium. Soon you will get the gist of it. Wow, it’s really puffy and pretty!